As we arrived, a long queue snaked out of London’s Spitalfields Market, waiting to enter the UK’s first ever gluten, dairy and refined sugar free Food Festival www.freefromfestival.co.uk on the second May Bank Holiday Monday. We were on our usual quest to find products that were not only gluten free but also dairy free so Ray and I could both eat them. There were plenty on display at the Festival. It was such a treat to wander round and discover that we could try items without having to ask if they were gluten free or dairy free, although we did check on a couple of occasions as we couldn’t quite believe it. First up was The White Rabbit Pizza Co www.whiterabbitpizza.co.uk All the pizzas are gluten free and the “Vegana” is both gluten free and vegan. 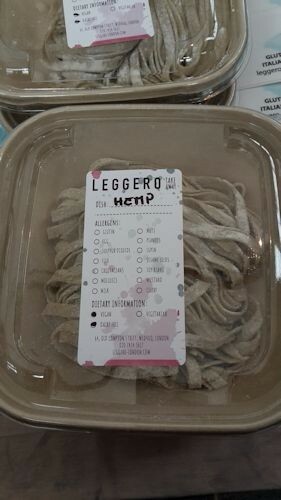 It tasted delicious with vegan cheese. 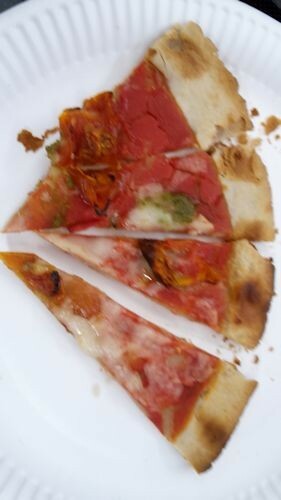 Most importantly, the bases was thin and crispy in true Italian style. The problem with gluten free pastry is that it can often taste cardboard-like, but not this pizza. No wonder the stand was crowded. The pizzas are available from Abel & Cole, Planet Organic and As Nature Intended. Fancy an ice cream? A van labelled Yorica www.yorica.com with 1960s style curly designs all over it was selling gluten free and dairy free ice cream made with coconut and rice milk. The ice cream is vegan and free from eggs, nuts and peanuts. In addition, it was selling gluten free dairy free waffles to go with the ice cream. Yummy! 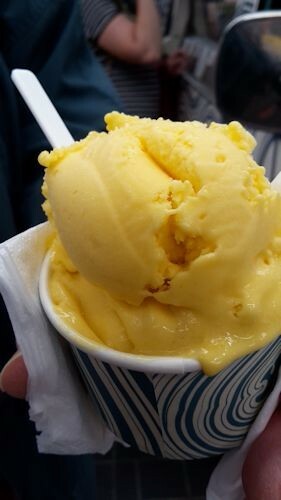 We tried the mango ice cream – it was delicious. Other varieties include rainbow candy, chocolate and orange and “peanot” butter (as opposed to peanut butter) as it’s made from soy. One of the highlights was the Nojo www.nojolondon.co.uk stand selling gluten free and dairy free crepes, made with rice milk and a mix of gluten free flours such as tapioca, rice and potato. 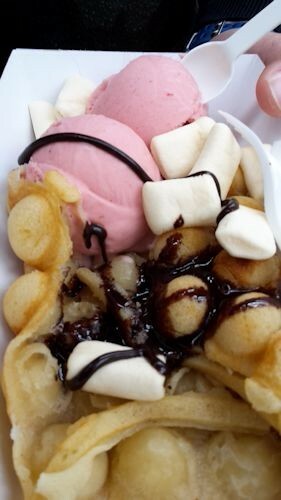 You could not only have a savoury crepe such as Chicken Terayaki or Veggie Vegan, but also sweet pancakes such as chocolate banana. 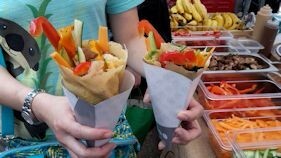 This was sensational; the crepes were succulent, moist and the combination of flavours wonderful. They have a unit in Camden Town so we’ll definitely be visiting there soon and they do deliveries in London. Green Sisters www.greensisters.co.uk was selling its range of gluten free and dairy free samosas, not only savoury, but also sweet. The company is run by two sisters Reena and Geeta. They are all vegan except the sweet varieties as they contain honey. 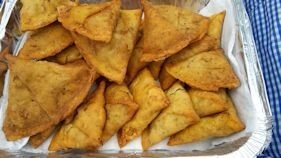 Ray was taken with the Summer Fruit Samosa with apples – “It tastes just like apple strudel,” he said. You can order their products frozen online for delivery in the UK. TrooFoods www.troogranola.com was exhibiting its range of hand-made gluten free granola kits, which don’t contain refined sugar. They are free from dairy, wheat, egg, sesame, as well as being vegan and vegetarian friendly. 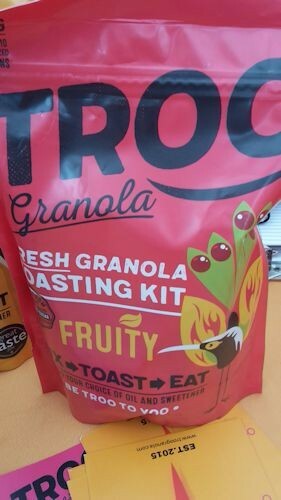 Founder Helenor Rogers says people are very inventive about the ingredients they add to the granola. “One of the most unusual has been mashed up sweet potato,” she says. 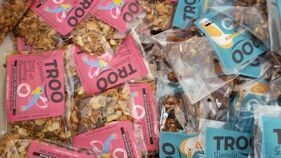 At the show packets of ready-made granola were launched, which were selling well. “We add chicory root fibre to sweeten it,” she said. It tasted great. You can order online. Raw natural snack bites were being snapped up on the Enough.Snacklab stand www.enough-snacklab.com . They look like mini cakes and taste delicious, as well as looking very appetising. All the ingredients used are gluten, dairy, soya and refined sugar free. 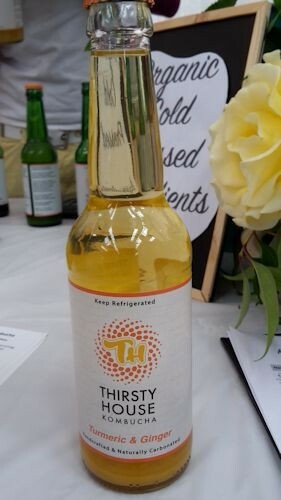 We tasted Turmeric and Ginger Kombucha drink on the Thirsty House Kombucha www.thirstyhousekombucha.co.uk , very refreshing. It is a fantastic alternative to fizzy, high sugar drinks. 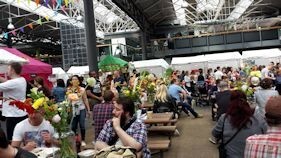 What started out as a home based cottage industry for founders Elizabeth and Shirley has developed into a dedicated kombucha brewery based in south west London. See the web site for where to buy. Leggero www.leggero-london.com , the restaurant in Soho, with a 100% gluten free kitchen, was selling its freshly made gluten free dairy free pasta. We have visited the restaurant several times as it not only offers gluten free cuisine, but dairy free choices as well. The fresh pasta only takes a minute to cook or two minutes from frozen. 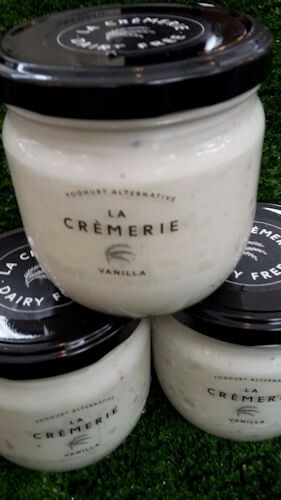 La Cremerie www.la-cremerie.co.uk was showcasing the UK’s first rice-based yoghurt alternative made with rice and selected ferments. 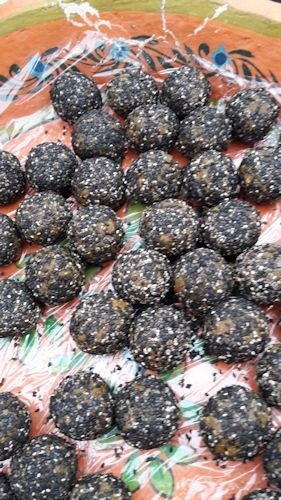 They are vegan and free from gluten, soy, nuts and added sugar. We did enjoy the vanilla variety. You can buy it from Farm Drop www.farmdrop.com and East London shops (see their web site). It will only be a matter of time before it’s freely available. We also had a demonstration of a new “Eat Safe” App www.eatsafeapp.co.uk a mobile restaurant directory that helps people with allergies find restaurants. They work with restaurants to gather menu information and double check it. Then you enter your requirements and the system shows you which restaurants offer the most choice. The App is currently being trialled and will be launched soon. Congratulations to the organisers of the Free From Festival. 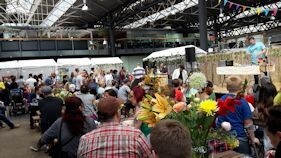 We found it a well-organised event with lots of discoveries and choice for people with food allergies. We are already looking forward to next year’s event!